I had bookmarked this recipe long back from my collection of recipes from Vanitha magazine.The accompanying picture looked so tempting that I really wanted to try it out immediately.But since procuring drumstick leaves is not so easy,I kept postponing it.Some time back,when amma was here,we almost stole[yes!] drumstick leaves from a nearby compound ignoring the threatening looks of the security guard,yeah we are that crazy about this leaf..hehe. So it was a big surprise for me when I found this roadside vendor selling drumstick leaves.I was trying hard to contain my excitement and bought 2 bunches for myself.I came back home happy and content and with a note to myself to make this curry without further ado. I usually make dosa whenever I get hold of drumstick leaves[which is rare,btw],so it was a nice change to have this curry.I love Erissery of any kind,with Pumpkin,with Chena[Elephant yam] and Kaya[Raw banana] and I liked this one too. Cook the toor dal in enough water till soft and mushy. Grind together grated coconut,jeera,red chilly powder and haldi to a coarse paste. Mash the toor dal well using the back of a spoon,add enough salt to taste and then add the ground masala. Mix well and let it come to a rolling boil. Add the muringa ila and mix well,close with a lid and cook for 5-10 minutes. In a kadai,prepare seasoning with oil and splutter mustard seeds followed by shallots,curry leaves and red chilly pieces. Add the grated coconut and roast till it gets golden brown. To the cooked dal-muringa ila mix,add the seasoning. *Erissery is usually a curry with a thick gravy,but with the measure provided in the recipe,I got a thoran[dry] like curry.No complaints though,it tasted excellent.but next time I am increasing the dal and the ground paste measures. I too have a subscription for vanitha magazine and first thing i look when i get it is wht they are cooking, but alas mostly i don't get the veggies here. 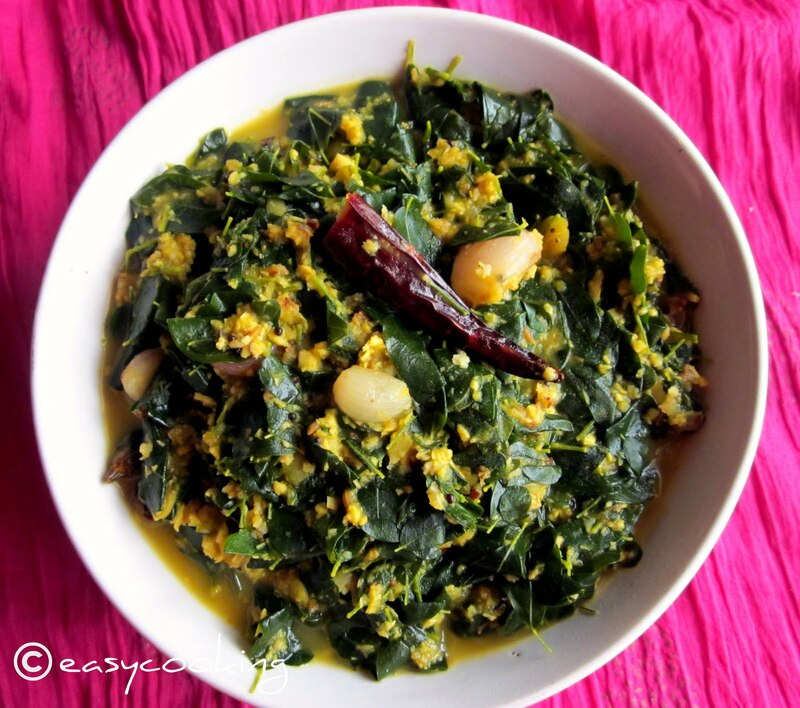 Yummy murunga illa recipe. i always stir fry this with galic pods, This is new to me and surely try this. Nice click, If you rap drumstick leaves in a newspaper and keep it in the fridge for i day,plucking the leaves will be easy. Wow.. looks gr8 and delicious !! I make this elissery with muringa ila sans onion. Now seeing you pic, I am tempted to try it like a thick gravy. Muringa illa Erissery looks deliicous. I love anything with muringa illa. Congrats on the blog! Its simply great!!! Now that Im not a newbie anymore (and for a few other reasons), that enthusiasm for cooking seems to be wearing off. Thanks to your site, that interest seems to have been rekindled. Hoping it'll last.